In a 3-2 victory over LGD Gaming, Mineski won the 2018 Dota 2 Asia Championships. It marks the first major win for a Southeast Asian team, a hard-won title for a few veterans, and a sign that the Dota landscape is not as set in stone as some might think. The story of this Mineski line-up doesn’t just start at DAC 2018, though. Head back to 2014, at The International 4, and you’ll find the foundation. Team DK was made up of a much-beloved lineup of all-stars. It was a team that played beautifully together, a mixture of perfect balance among its players and no reliance on one person to be the hero. 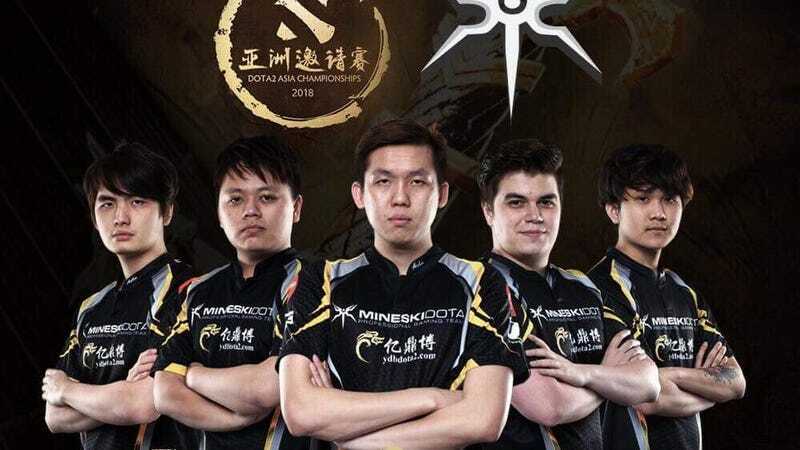 The team disbanded after it fell short of expectations at TI4, but two players—Chai “Mushi” Yee Fung and Daryl “iceiceice” Koh Pei Xiang—and former coach Tang “71" Wenyi have now reassembled under the Mineski banner, joined by assorted talent from the scene. The latter, coach 71, was only a recent addition to the Mineski roster, but in short time he’s helped build the team into a roster that can challenge the top contenders in the Dota pro circuit. And over the course of the last week, they did just that. Dropping only a single game to Virtus.Pro in the group stage, Mineski kept its winner’s bracket run alive, tearing through OpTic and Vici before meeting LGD in the winner’s bracket finals. The team didn’t just win games, but set trends while doing so. Iceiceice’s Pangolier was easily one of the best of the tournament; the hero had been enabled for competitive play mid-tournament, and he used it to great efficiency, whether sustaining his team with auras like Crimson Guard and Pipe, or just casually baiting out a Tidehunter ultimate with an illusion. Behind the team the whole time was coach 71, who has been given some credit for turning this team into a major-winning squad. Following his path from DK through to now, it’s easy to see how his approach to coaching has often brought about results. He’s also great at pumping up the crowd. When Mineski and LGD met again in the finals, it was huge for a few reasons. LGD was the home-crowd team in Shanghai, coming off a huge upset over Virtus.Pro. Mineski was on the cusp of making history. Both teams had upset the balance; though the Dota pro circuit had been dominated by either European (Secret, Liquid) or Russian (Virtus.Pro) teams, it was a China versus Southeast Asia match-up in the grand finals. The two traded back and forth. Where game 1 saw LGD roll over Mineski with Phantom Assassin and Tiny, Mineski responded in kind in game 2, with a Gyrocopter pick that picked apart the LGD lineup. The fights were so hectic, commentator Owen “ODPixel” Davies shifted into a new gear just trying to communicate the action at hand. It was individual plays, like iceiceice’s beautiful Skewers as Magnus or Michael “ninjaboogie” Ross Jr. landing the perfect Glimpse timing on an escaping Anti-mage, that made the difference for Mineski. It was a team that could not only play interesting picks and adapt to the enemy team, but also played well as a single unit. Hints of the old DK glory were in there, the team just looked cohesive and confident in a way it hadn’t in a while. Really, it’s incredible to see a team that went 12-14th and 9-12th at its last two major appearances suddenly turn things around. It was so surprising, even after the team’s winner bracket run, that even the commentators flubbed in calling out the major winner. This new-look Mineski is formidable, and a reminder that Southeast Asian Dota is still here to play. It’s getting harder to act every year like the SEA wins at major Dota events are a surprise or Cinderella story. Under the coaching of 71, with the play of two of the region’s legends in Mushi and iceiceice, this is a team to watch out for. The grand finals win in Shanghai boosted the team from 9th to 4th place overall in the Dota circuit, and there are still plenty of events left between now and the next International. Plenty of opportunities for Mineski to keep reminding us of how globally competitive Dota 2 really is.